I do not remember ever being happier for, or more skeptical about, the first day of spring. A part of me still does not believe the cold will ever go away. Not to state the obvious, but it has been a long, brutal winter. More than ever, I am looking for those first signs of spring. I need something that signals the time for hibernation is over and I can happily go outside again. The ice skating rink near my house is finally gone. The green of the turf in the playground where the rink once stood is a welcome sight. I saw my first Cardinal yesterday and the first crocus are popping up out of the ground. Maybe spring is really here. 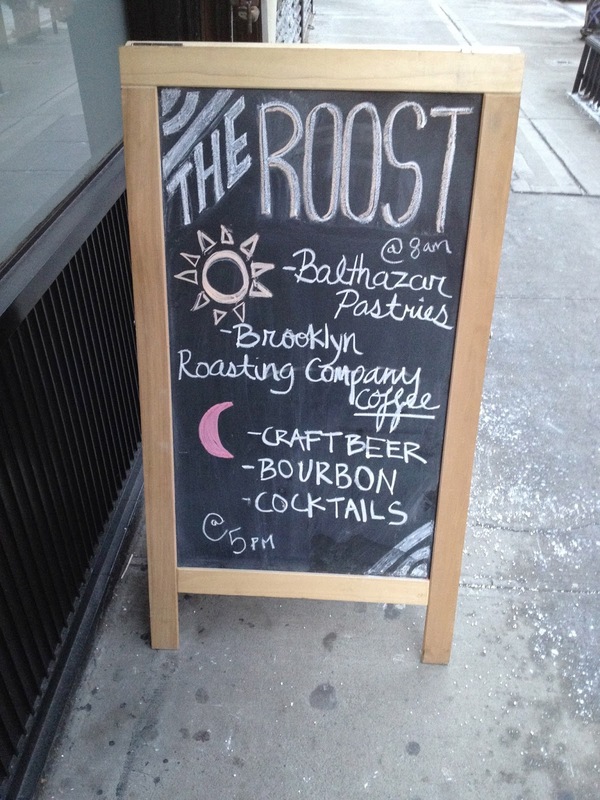 This sign is for a new spot on Avenue B called The Roost. It is a coffee shop by day and a bar at night. Stop for a moment and take in what this sunny little chalkboard says they have on offer. 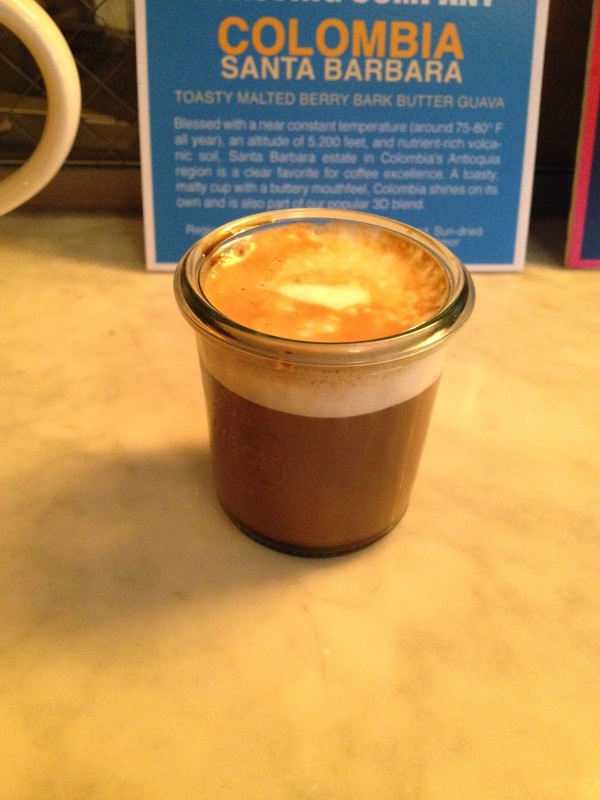 Brooklyn Roasting Company coffee and Balthazar pastries starting at 8 am. Craft Beer, Bourbon and cocktails starting at 5pm. Can you be all things to all people? I don't know. But it would seem The Roost wants to be all things to me. Let's start with the coffee shop. It is a charming spot. The counter and coffee bar are white tile and marble. The small seating area has exposed brick with some painted wainscoting. There are a few stools by the big front windows. The space is warm and welcoming as are the staff. Behind the coffee bar there is a second room with the feel of a an old pub or library. Over-sized leather chairs and a couch sit in front of a fireplace with a faux-fire burning. It would be a nice place to have a cup of tea or a nice porter and whittle away the afternoon. If The Roost was only this little store front coffee shop it would be a welcome addition to the neighborhood. It isn't. At 5pm the back wall of the club room (pictured above) slides open to signal that the bar is open for business. What a handsome, nicely stocked bar it is. During the day, sunlight pours in through skylights, original to the building, making the industrial chic interior feel warmer and more welcoming than most similarly designed spots. Light fixtures hung from old pulleys and bar stools that remind you of your old school room desks add to the charm. The best feature of the room is its size. It is long and deceptively wide which allows for a communal table and leather love seat up front and a deep bar and ample seating along the opposite wall in the back. What this all adds up to is something familiar yet a little bit unique, especially for a new coffee shop and bar in the East Village. A true Local. The coffee shop serves serious coffee, from a local roaster, well prepared, but without some of the more precious trappings of other well known shops. The sliding wall leading to the bar is not a gimmick. There is no bouncer, secret password or phone to call. It is just the door to the bar. Once opened it stays open and all are welcome. There will be a cocktail menu but this bar is meant to be just that, a really good local bar. It has a strong bourbon selection and some nice gins. It has a very good beer and craft beer list. The bartenders are pros and can make you a good cocktail. But if you are looking for house made bitters and shrubs you are in the wrong place. The other night my wife and I stopped in for a drink. We ordered two Maker's Mark 46 Manhattans, up. Matthew, our charming bartender, apologized that he did not have any Martini glasses and asked if it was okay that he gave them to us in an Old Fashioned glass. We replied that it would be fine. They were delicious and went down far to quickly. My wife pulled the cherry out, bright red and clearly store bought and said, "wow, I haven't had one of these in a while." She was right. I couldn't remember the last time I had a cherry that wasn't house made. Hell, I make my own maraschinos at home. Guess what? I loved it. Don't get me wrong, I love all the temples to cocktails in this city and frequent them as often as possible. But sometime you just want to walk into a bar, sit down, order a drink from a smiling bartender and exhale. What does all this have to do with spring and the idea of rebirth? The Roost is located in the former Luca Lounge spot. When Luca Lounge closed it appeared that yet another East Village stalwart was lost to rising rents and a changing neighborhood. I am happy to report that The Roost is owned by Vito DiTomaso, the former owner of Luca Lounge (and current owner of Luca Bar on St Marks). This is his reboot. Another great local bar with a coffee shop added, a smart way to maximize your income in a space that surely has ludicrous rent. It also turns out to be a smart way to ingratiate yourself to a neighborhood. They come for the coffee, and when told about the bar in back they are intrigued, not fearful. The real genius of The Roost is the fact that it is a bit of a chameleon. This hit home for me when the wife and I stopped in for those Manhattans. The lovely Tanya welcomed us and informed us that the coffee bar was closed but drinks were available up front if we found the bar too crowded. We were able to find seats at the bar and enjoyed ourselves. I marveled at the different feel the three rooms at The Roost have. A fine bustling bar in back to drink with friends. A dark, intimate room in the middle to linger in with that special someone. A quiet front room to have a glass of wine and a real conversation. All of these exist behind a single store front on Avenue B. The Roost may not appeal to everyone in the neighborhood, but my guess is it comes pretty close. The Roost - 222 Avenue B, between 13th & 14th Street. I need to check my old homie, Vito DiTomaso! This restaurant looks very cosy and relaxing. A typical pub/bar or coffee shop that caters everyone including the writers from top 10 essay writing services. Always people are very happy with the first signs of spring, because after a long and cool winter it is a wait of warmth and joy. Hey Guys, Here you will be able to find out the best portal for play happy wheels free online games and these games are amazing games. You can access to these games online without facing any type of problem or error and these are available in the best quality. These games are played with the help of keys as Arror keys are used to move, Space keys is used to jump and Ctrl+shift keys are used to grab or throe balls. Once go for these games. Its a very awesome page with the very valuable thoughts. Eat healthy as possible during your time at college. Many people gain a few pounds their first year in school. Make sure you're aware of your eating.Avoid overconsuming fast foods and pizza on the go. It is cheap and quick, but it will leave you feeling sluggish and unable to concentrate in your classes. I like cafes with a small sitting area and a special atmosphere. Also, I like writing my essay for https://specialessays.com/interview-essay-writing-service/ sitting in these cafes. It's the best atmosphere for me. And what is the most comfortable place for you?